CTA’s northern hemisphere site is located on the existing site of the Instituto de Astrofisica de Canarias’ (IAC’s) Observatorio del Roque de los Muchachos in Villa de Garafia on the island of La Palma, the fifth largest island in the Canary Islands. At 2,200 metres in altitude and nestled on a plateau below the rim of an extinct volcanic crater, the site currently hosts an operating gamma-ray observatory, the Major Atmospheric Gamma Ray Imaging Cherenkov (MAGIC) telescopes, as well as a wide variety of optical telescopes of various sizes. 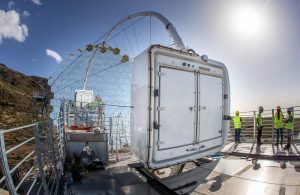 While the southern hemisphere array will span the entire energy range of CTA, covering gamma-ray energies from 20 GeV to more than 300 TeV, the northern hemisphere array will be more limited in size and will focus on the low- and mid-energy ranges from 20 GeV to 20 TeV. For this reason, the northern hemisphere site will not host any Small-Sized Telescopes, which are tuned to capture the highest-energy gamma rays. 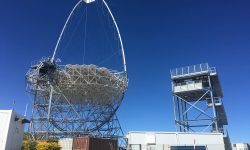 The plan is for the site to host four Large-Sized Telescopes to capture the low-energy sensitivity of CTA and 15 Medium-Sized Telescopes to cover CTA’s core energy range. On the night of 14-15 December 2018, the Large-Sized Telescope (LST) prototype recorded its first Cherenkov light on the northern site of the Cherenkov Telescope Array (CTA), located at the Instituto de Astrofísica de Canarias’ (IAC’s) Observatorio del Roque de los Muchachos (ORM), on the Canary island of La Palma. On Wednesday, 10 October 2018, more than 200 guests from around the world gathered on the northern array site of the Cherenkov Telescope Array (CTA) to celebrate the inauguration of the prototype Large-Sized Telescope (LST). 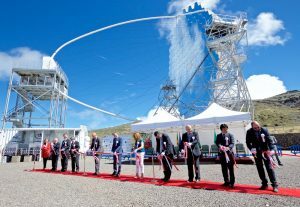 The telescope, named LST-1, is intended to become the first of four LSTs on the CTA-North site, which is located on the existing site of the Instituto de Astrofisica de Canarias’ (IAC’s) Observatorio del Roque de los Muchachos located in the municipality of Villa de Garafia on the island of La Palma. On 25 September 2018, the team constructing the LST prototype telescope, achieved the final major milestone of the construction project when they successfully installed the camera. The camera, which covers a field of view of around 4.3 degrees, is composed of 1855 photomultiplier tubes (PMTs) – devices that transform the light into an electrical signal. After a complete performance review at the Institut de Fisica d’Altes Energies (IFAE) in Barcelona (Spain), performed with LST members from Madrid (CIEMAT, UCM) as well as France (CPPM, LAPP) and Japan (ICRR, Kyoto University), the camera was shipped to La Palma at the end of the summer, but it was not until 24 September that it was finally transported up to the ORM and then successfully installed on 25 September. On 17 February, the LST prototype structure was completed when the dummy counterweight was put into place. The counterweight structure resembles the camera support structure but is somewhat shorter and heavier, allowing the dish to turn toward the park position. In this position, 198 segmented mirrors will be mounted in the coming months. The dummy counterweight will be removed before the installation of the proper camera support structure in June 2018. Read more: https://www.cta-observatory.org/lst-structure-complete/. In addition to the LST prototype milestones, there was considerable activity on CTA’s northern hemisphere site in the second half of 2017. The CTA Project Office, along with the Managing Director, made several visits to the island to meet with local authorities and to continue infrastructure surveys and planning. With the topographical survey and power concept studies complete, the positions of the telescopes, buildings and underground services on the site are now defined and detailed designs can begin for the array’s power distribution system. Tendering will start in 2018 for the first phase of the design contract with local architects and engineers, which includes starting the environmental impact assessments for the site. The detailed design and obtaining the necessary permits for construction, will take approximately one year. If all goes as planned, the first phase of construction should start in the middle of 2019. 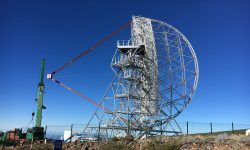 On 4 December 2017, The LST prototype, under construction at Roque de los Muchachos Observatory in La Palma, reached an important milestone when its 18-ton mirror dish, mostly made of reinforced carbon fiber tubes, was lifted to the lower structure successfully. After careful preparation, the dish was lifted 18 meters above the ground and secured using a 200-ton crane. The whole operation only took four hours. 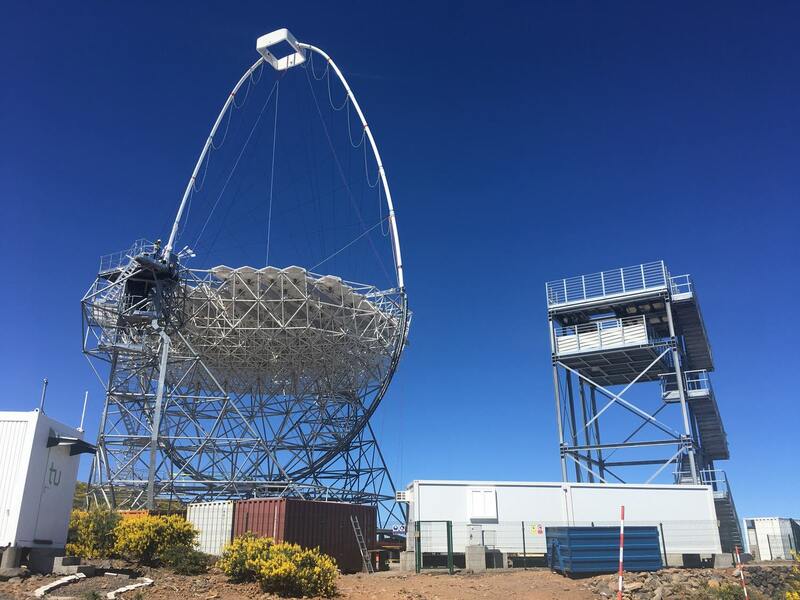 A big congratulations to the team for bringing the telescope one step closer to operation! Watch the time lapse on YouTube: https://youtu.be/Qm-QI50TovE. In July, the prototype’s center pin was installed in the middle of the foundation to support the mechanical structure of the LST. The circular 23 m diameter rail and six wheel bogies used to spin the telescope have been installed. The lower structure, which is the mount on which the mirror dish will be placed, is near completion. 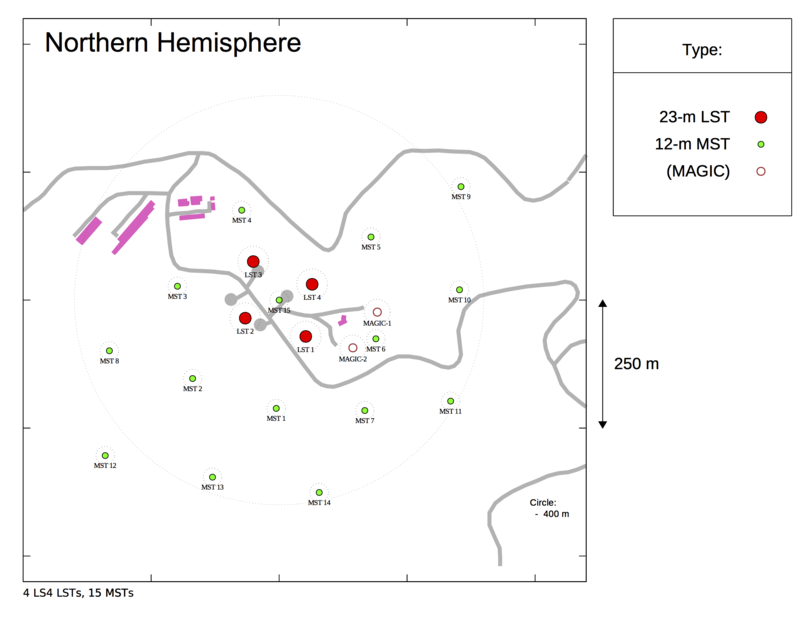 The CTA northern hemisphere array site in La Palma has been full of activity recently as site infrastructure design studies commence. Work on the site’s infrastructure, which is being coordinated by the CTA Project Office, is well underway. 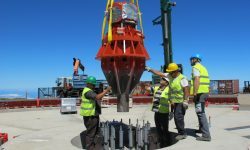 A Madrid-based company, Geo-Avance, has been contracted to conduct the topographical study of the site, which is estimated to begin in May. The study will report on the site’s characterization by taking detailed accounts of the contours of the rolling, rocky hills of the site and giving a bird’s-eye view with aerial photography. These details will be integral to design decisions for the placement of telescopes, roads and underground services (power and data). Preparations are underway for the geotechnical study, which is estimated to begin this summer. The foundation for a prototype of CTA’s largest telescope, the Large-Sized Telescope, was completed on 11 January 2017. The main elements of the foundation, the telescope and the camera access tower foundations, were constructed with 620 cubic metres of concrete or about 1,500 tonnes! 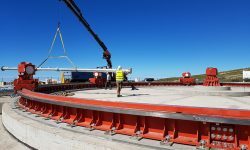 This massive amount of concrete will help keep the telescope and its mirror (400 square metres) stable with winds up to 200 km per hour. Additionally, a large area of the land next to the foundation has been flattened so it can be used to assemble the telescope structure. 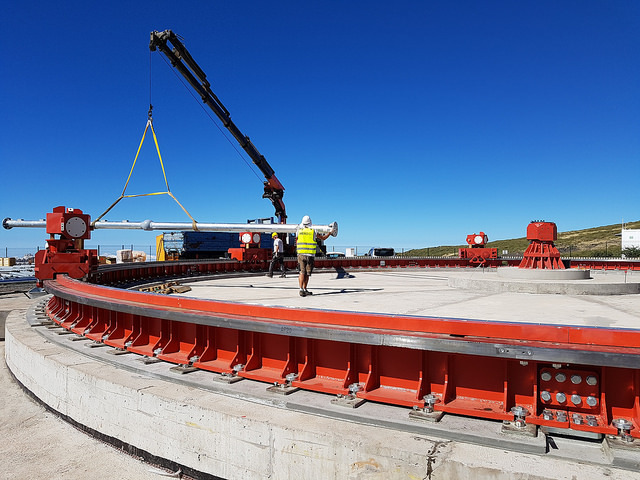 The next step is to install the circular 23 m diameter rail used to spin the telescope, followed by the installation of six wheel bogies. The telescope structure is planned for installation between April and October. The camera access tower should be built in September and, in the final step, the camera is scheduled to be installed in November 2017. The hosting agreement with the Instituto de Astrofisica de Canarias (IAC) was signed in September 2016 (read the press release). 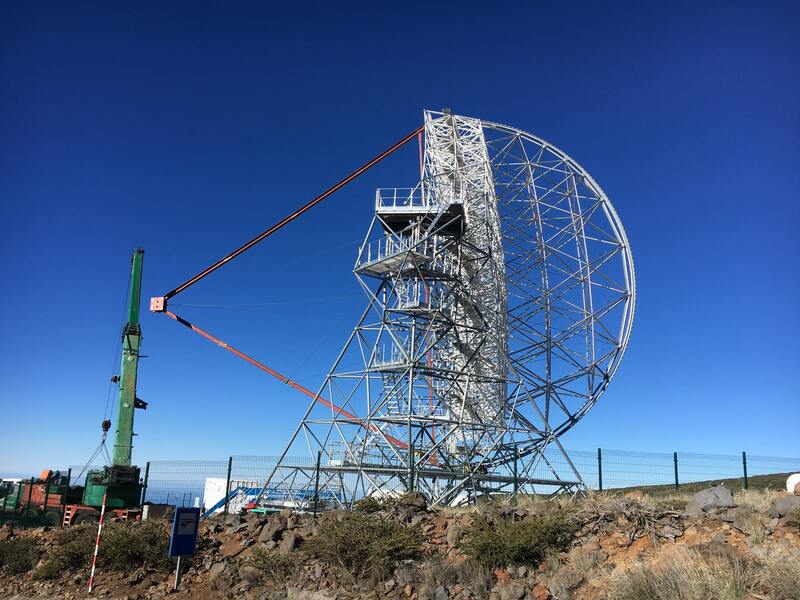 The agreement allows the construction of the CTA northern array to proceed at the Roque de los Muchachos site and ensures access to the infrastructure and common services needed for the operation of the Observatory. 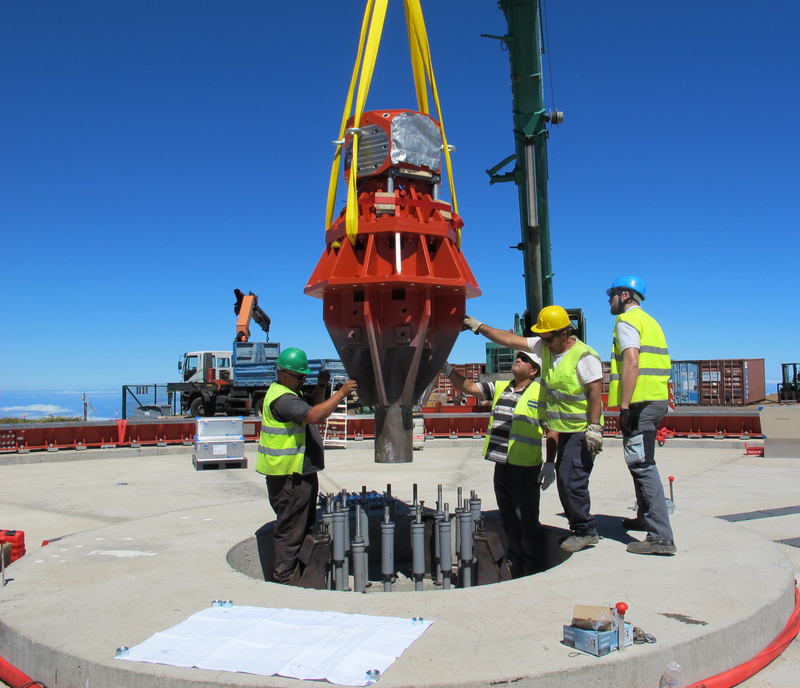 On Friday, 9 October 2015, the first stone-laying ceremony for the Large-Sized Telescope (LST) prototype took place at the Roque de los Muchachos Observatory (ORM) on the island of La Palma (read the press release). Go to the southern hemisphere array.